The mission of Conway Conversations is to provide a space for members of the UCA campus and Conway communities to come together and engage in conversation about social issues affecting diverse groups of community members. If you would like to assist in facilitating a Conway Conversations event, please contact Lesley Graybeal at lgraybeal@uca.edu. This program is jointly supported by UCA Outreach & Community Engagement, UCA Office of Institutional Diversity, the UCA Office of University Training and the UCA Center for Leadership Development. UCA will host a Human Library event on April 9, 2019 from 1:40-4:00 pm in Torreyson Library.The Human Library is a concept created by Ronni Abergel, Dany Abergel, Christoffer Erichsen and Asma Mouna of the Danish youth organisation Stop The Violence in 2000 and it is now operational on five continents. It is a library of human beings, individuals, that each represent a group in the community that are somehow exposed to stigma, prejudice and/or discrimination. The Human Library™ aims to establish a safe conversational space, where difficult questions are expected, appreciated and hopefully answered by the Human Book on loan. It was developed to challenge societal prejudices wherever and for whatever reasons they occur, and to help people form a better understanding of those with whom they share their communities. The Human Library™ encourages patrons to become readers, by taking a person out on loan for a conversation on the topic/issue, that they represent. i.e. the Police Officer would talk about stereotypes and prejudices that police officers meet in their job and answer any question the reader may have about this topic. Conversations are offered to a duration of thirty minutes and is not just a storytelling session, but rather an experience sharing with Q&A encouraged. The outcome of the session and direction of the talk is dependent on what the reader/s asks about. And it is the privilege of both parties to end the conversation at any point they may wish. The University of Central Arkansas and Torreyson Library joins a long and growing list of organizations interested in promoting understanding and compassion between people where prejudice and stereotyping have created misunderstanding and division. 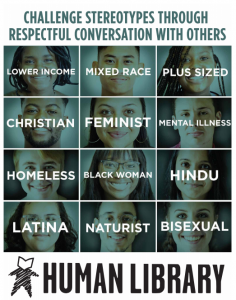 Learn more and sign up to be a “human book” at https://uca.libguides.com/HumanLibrary.